A Must Do Tour in Manuel Antonio for Avid Birdwatchers! With 300 species of birds to be found in the Manuel Antonio area, this is a must-do tour for all avid birdwatchers! Your day begins early, around 5:30 a.m., when your guide meets you at your hotel and drives you 40 minutes to the outskirts of the Manuel Antonio area, where you will explore the primary and secondary forests to spot an array of birds in the area. Your guide will be a wealth of information and will help you to observe birds such as toucans, parrots, tanagers, warblers, fly catchers, wrens, woodpeckers, and wood creepers! 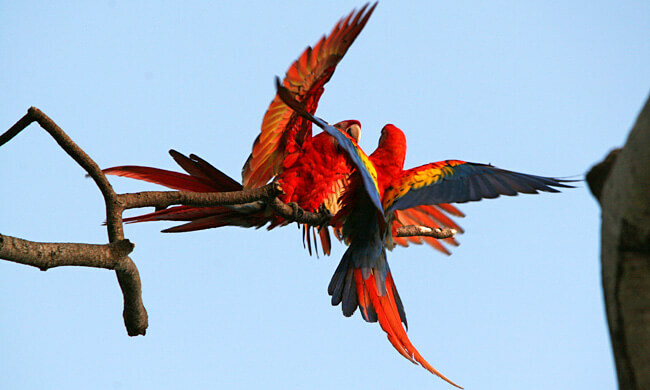 You might even be lucky enough to catch a glimpse of the beautiful scarlet macaw. Tour includes: guide, transportation, lunch, refreshments, fruit. What to bring: binoculars, comfortable clothes and shoes, hat, insect repellent, sunscreen, camera.